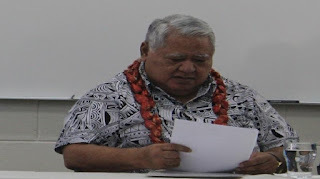 Samoa Prime Minister Tuilaepa Sailele Malielegaoi has sent a congratulatory message to Labour leader Jacinda Ardern on her appointment as Prime Minister of New Zealand. In his letter to the PM-elect, Tuilaepa said Samoa and New Zealand have enjoyed warm relations in various areas of mutual interest and he looks forward to working with Ardern to further strengthen the ties between the two countries and her people. ‘Similarly I look forward to our close collaboration on issues of importance to our Pacific region and the cooperation arrangements between the Pacific Forum countries. Ardern was appointed New Zealand Prime Minister last week.